What is your desert island food? You know, the food you would pick to eat if you were stuck in a desert island and could only choose one thing? Mine would probably be a caprese salad. Preferably with some crusty sourdough and a glass of wine. Oh, and ice cream. But then a desert island probably doesn’t have a freezer. And that’s about 4 foods. Whatever, this is my desert island scenario. It’s not like I’m actually getting trapped on a desert island with my choice of food. Is a desert island even a real thing? I feel like the words ‘desert’ and ‘island’ together is an oxymoron. These are the musings of a sleep deprived mama at 2 am while my child eats. Anyway, I really love caprese salads. Especially in the summer when tomatoes are just right and I have a couple of basil plants (which is really the only plant I can keep alive) in the flower beds. I basically live off of fresh caprese salads during the summer. They’re so easy and delicious, the perfect summer side dish! 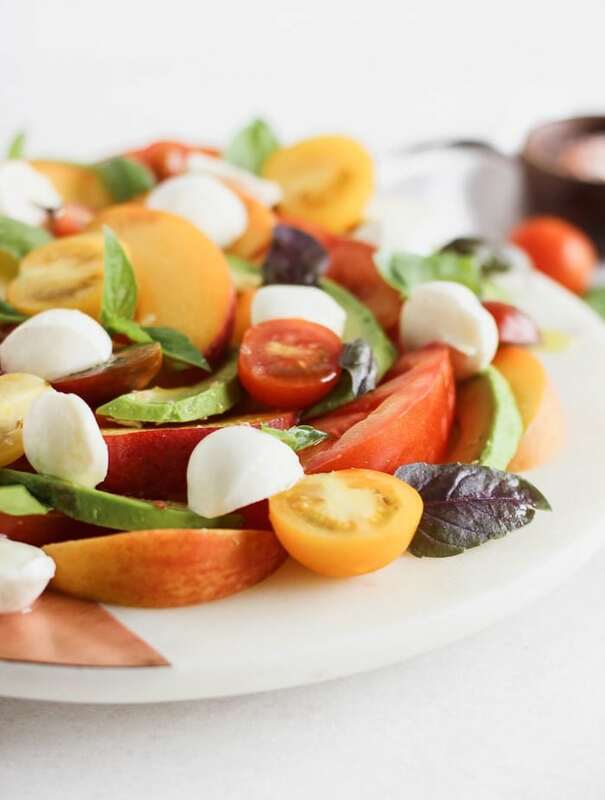 I also love all kinds of variations on caprese salads – with peaches, avocado. Yes, please! 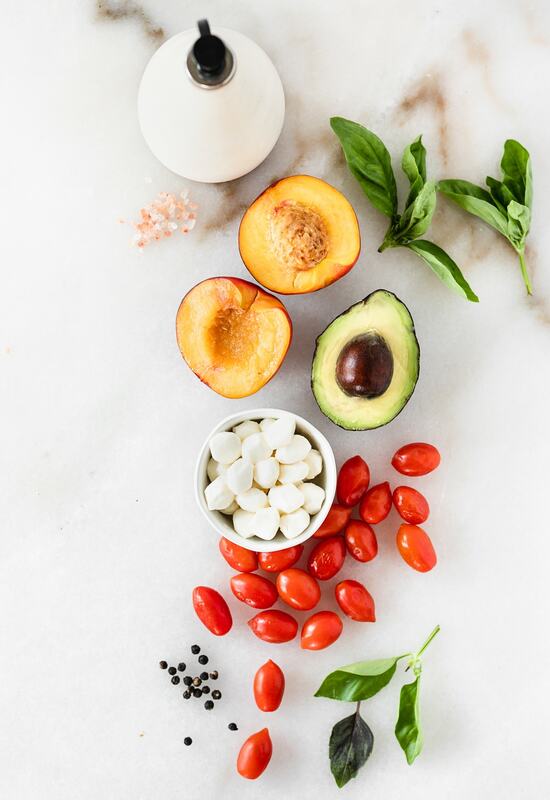 So I’ve combined all of my favorites into the ultimate peach avocado caprese salad. 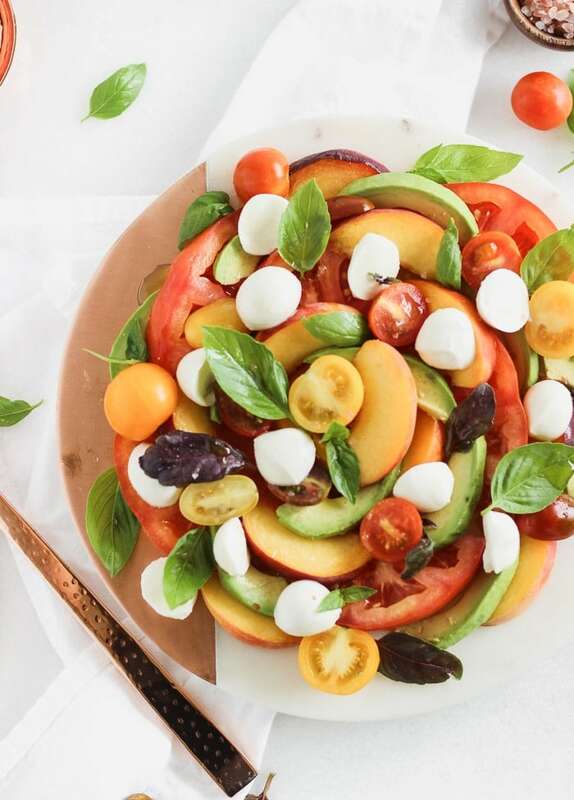 Not only is this gorgeous peach avocado salad insanely delicious, it’s also so simple to make. That’s what I love about summer food – it tastes so good without you having to do much to it. All you need is some fresh, ripe produce for a delicious meal. 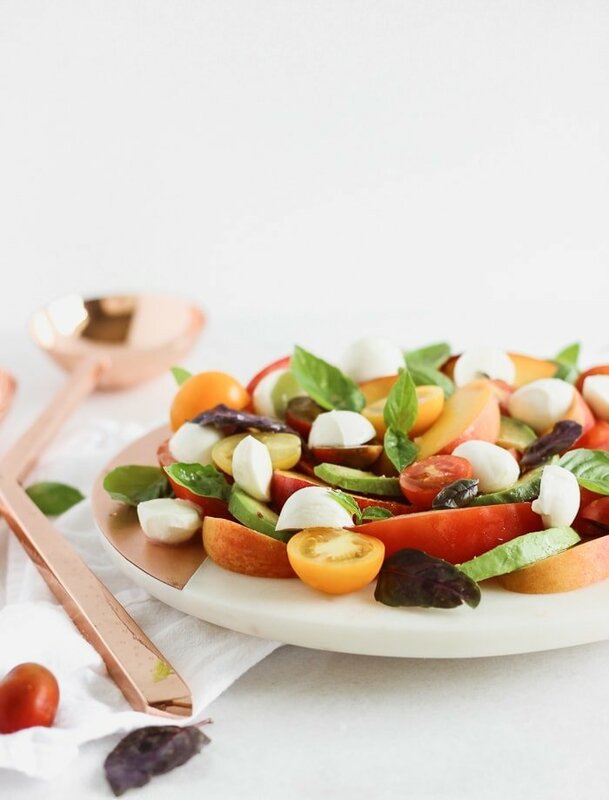 This caprese salad is the perfect summer side dish to make use of all that amazing summer produce, and an effortless but stunning dish you can take to gatherings or enjoy on a lazy evening with a glass of wine and some crusty bread. And if you happen to be going to a desert island, pack some of this up to take along with you! 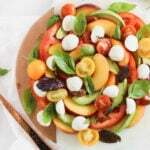 Thinly slice tomato, peach and avocado. Half cherry tomatoes if using. Arrange on a serving platter. Half mozzarella pearls. 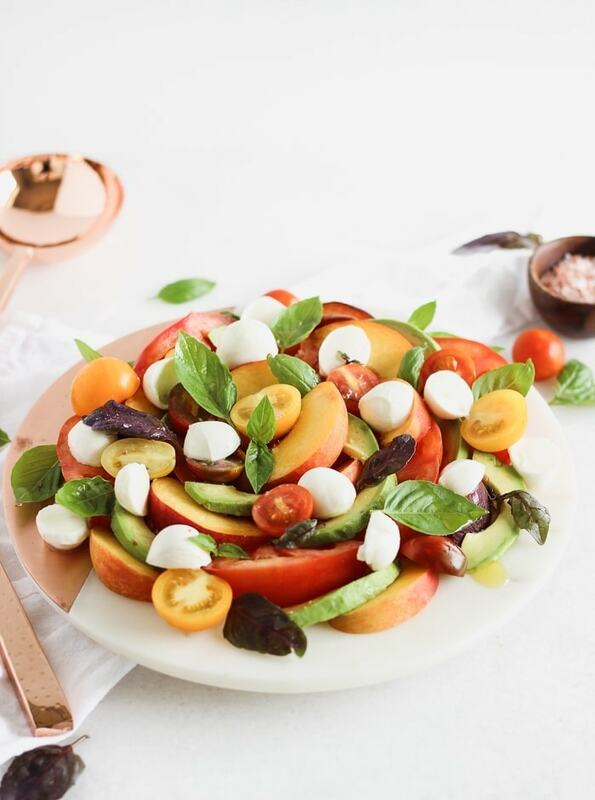 Add to platter with tomatoes, peaches and avocado. Top with fresh basil. Drizzle with olive oil and balsamic vinegar. Sprinkle with salt and pepper to taste.